National Adoption Day is observed annually on the Saturday before Thanksgiving. This event is focused on raising awareness of children in foster care waiting to be adopted. 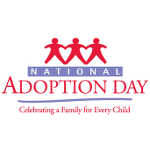 The first National Adoption Day was held in 2000 by a coalition of national partners which included Children's Action Network, The Alliance for Children's Rights, Dave Thomas Foundation for Adoption and Freddie Mac Foundation. In 2002, the Congressional Coalition on Adoption Institute and Casey Family Services joined the coalition. The National Adoption Day sponsors co-operate with states foster care agencies, child advocates, law firms, and courts to complete the adoptions of children in foster care. Since the inception of National Adoption Day, more than 54,000 children were moved from foster care to forever families. In 2014, more than 400 cities across the United States, the District of Columbia and Puerto Rico held events to finalize the adoptions and celebrate the families who adopt. In the United States, there are more than 100,000 children in foster care. California and New York have the largest population of foster care children. A foster child usually has to wait nearly 4 years to be adopted, but more than 20,000 kids age out of the foster care system at age 18 every year without either forever family or permanent home. The aim of National Adoption Day is to provide forever families to as many children as possible.